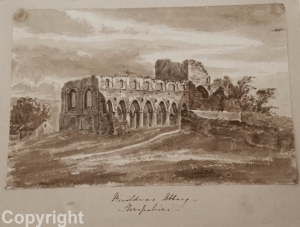 The Reverend John Louis Petit (1801-68) was an extraordinary Victorian topographical watercolour artist, whose work, for reasons that will be explained, has only recently been rediscovered. 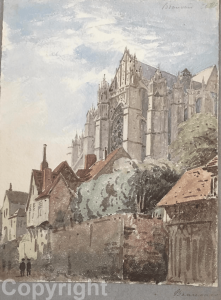 Yet John Louis Petit was more than just an artist, he was one of the leading architectural speakers and writers of his age, and one of very few who stood against the tide of copy gothic that was so fashionable in the 19th Century. This website has been established by The Rev. Petit Society, as part of its work to promote a wider understanding and appreciation of the Petit’s life and work, including his architectural writing as well as painting. This update is from February 2019. The site provides brief information about objectives and activities, services and a contact point (this page); a biography and more detailed information about J L Petit’s art and architecture on the other pages; and an exhibition of 70 or so works. The update introduces the book on Petit to be released in March 2019, and other publications, and makes minor improvements throughout. The Rev John Louis Petit was a famous figure in the world of ecclesiastical art and architecture in his time. Now he is considered a minor figure by those who know the period and is unheard of by non-specialists. This resulted from a few unfortunate events. In particular, Petit never sold his art, practically all of it was closely held until most, thousands of pieces were sold in bulk lots, mainly at auction, in the mid 1990s. This included unfinished sketches and many works by his sisters not separately identified. Similarly overlooked are his architectural contributions. In this case they were deliberately downplayed by his opponents who outlived him. Nothing worthwhile had been published about Petit until recent times. The November 2017 (volume 18, no2) article in the British Art Journal (http://www.britishartjournal.co.uk) is the first serious overview of his artistic achievements and illustrates how his style developed over his career. This website follows the categorization in that article. Secondly, concerning his architectural writing, Ecclesiology Today, journal of the Ecclesiological Society (http://ecclsoc.org) recently published and article in their July 2018 vol 55-56 issue. This assesses his contribution to architectural thought and especially his emphasis on preservation, originality, and beauty through form and proportion. The first book on his art in Staffordshire will have come out in March 2019 see announcement and ordering details here. Please do send comments, or register on our database to pre-order other publications at a discount at books@revpetit.com. The second objective is to correct ‘fake news’. 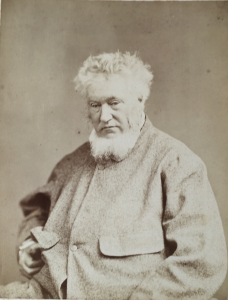 Biographies exist in the Oxford Dictionary of National Biography (http://www.oxforddnb.com), bits of which were repeated in various dealer websites and other sources such as Wikipedia (https://en.wikipedia.org/wiki/John_Louis_Petit). These all contained both significant factual inaccuracies, omissions and, in our opinion, over hasty judgments. As at 2018, the ODNB has agreed to publish corrections and review the balance of its entry, but has been delayed for technical reasons. Wikipedia is now correct and will be expanded. The major dealers are now broadly correct; some ebay dealers still carry old stuff. Correcting mis-attributions of artwork is harder. 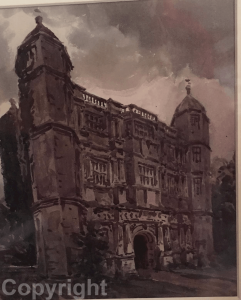 The key London watercolour dealers (Abbott and Holder, Chris Beetles, Guy Peppiatt) do not mis-attribute Petit watercolours; however those advertised by traders on ebay are sometimes not right and occasionally resist correction. Auctions are not reliable. The third objective aims to promote exhibitions of his work, either singly as part of other exhibitions, or more importantly large exhibitions of his work only. Petit’s work and achievement can best be appreciated when viewing many examples alongside each other. In this way it is possible to appreciate the incredible range and beauty of our architectural heritage, from across Europe, and begin to see what he was trying to communicate. The Society has collected examples of his finest work, held by the Society or by ourselves individually, to support such exhibitions. Few works are held in public collections, and even fewer good ones. Exhibitions are under consideration, albeit for the 2023 timeframe ! Finally, we aimed to place reference collections of his work in museums. By reference collections we mean covering all his different styles, which varied over his lifetime, and including architectural sketches and work of his sisters for comparison, and so that these are no longer a source of confusion. The biggest public collection at present is at the National Library of Wales. It is not representative, not very accessible for most of the population, and nothing is on display; so in the longer term we plan for something larger, more central, and more visible. The Society has been acquiring and will continue to acquire Petit’s work for these purposes. Together with its members it now has the largest collection worldwide covering all Petit’s career. Eventually some may be sold for the benefit of the Caerdeon Chapel, the one church Petit built, or for conservation or publications, but for the time being it forms the basis of the research. Associate membership of the Society is open to those who want to help promote its objectives. Please contact us using the address below. The Society will incorporate as a charitable organisation when it needs. 1. Organising loans of individual pictures or groups of pictures for exhibitions. Currently, directly and through associated private collections, we have access to over 450 exhibition standard works, many more sketches, and works by his sisters for supporting material and comparison. We also have copies of the majority of his 6 books and estimated 50 articles and speeches (although not all). 2. Authentication. Since Petit did not sign his work, and nor did his sisters, most of their work is passed off as his. In one recent auction a work dated after his death was attributed to him. We give opinions on attribution, based on experience of having viewed over 2,000 works over the past four years.